The Illuminated Tarot grew from my interest in learning about tarot symbolism and archetypes. I pulled a card at random each week and created my own version. By the end of the year I had illustrated fifty-three cards that fold the Major and Minor Arcana into a deck that can be used for both gameplay and tarot readings. The deck was first published in 2017 by Clarkson Potter. Each set contains a fully illustrated deck and a guidebook with short card descriptions and an introduction to reading the cards. 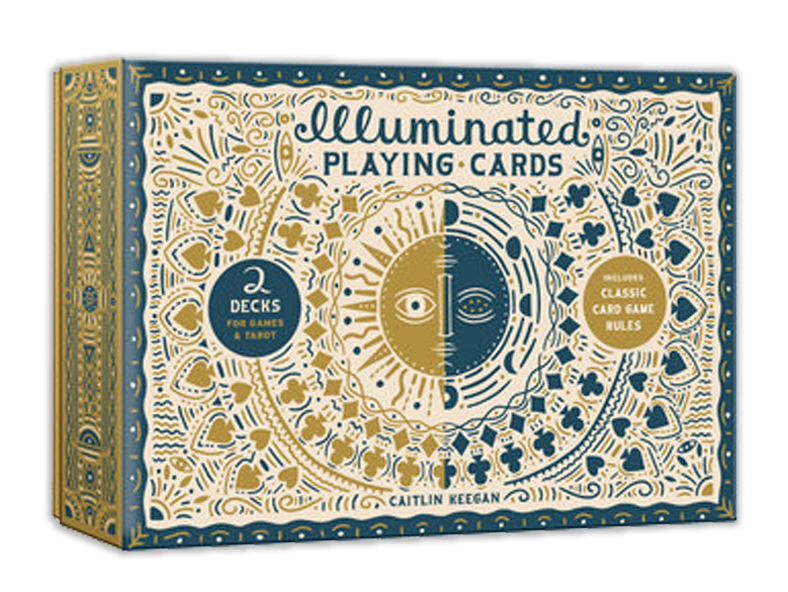 A playing card-sized edition (Illuminated Playing Cards) will be published in Spring 2019. What inspired you to make this deck? I've been interested in tarot since I was a teenager, when I discovered a deck my mom had called Morgan's Tarot. From then on, I became fascinated by the wide range of visual interpretations that exist in the world of tarot. What interested me even more was the underlying system involved. The tarot depicts universal characteristics of human experience: beginnings, endings, and everything that occurs in between. It is meant to represent all facets of our relationships with others and with ourselves. As an artist and illustrator, I am interested in the ways that image interpretation can help us connect with our intuition. Images have the power to communicate in general outlines while leaving space for the reader. Within that space, we can look inward, reassess, and create a new context for life situations. The tarot usually has 78 cards, but this deck has 53. How does that work? Traditional tarot decks like the Rider Waite Smith deck have 78 cards: 22 Major and 56 Minor Arcana. The Illuminated Tarot has 52 cards like a standard playing card deck. The Joker (which corresponds to The Fool) is the 53rd card. In The Illuminated Tarot, the Major Arcana are combined with specific Minor Arcana cards. To determine which cards would be combined, I used numerological correspondence and my own intuition, based on research of traditional card meanings. The Illuminated Tarot has Jacks, which correspond to tarot's Pages, but does not include Knights. Tarot was originally a card game and evolved alongside traditional playing cards, so the suits correspond: Swords = Spades, Cups = Hearts, Wands = Clubs, Coins/Pentacles = Diamonds. Each suit has a specific connotation which is described in the guidebook. How were the Major and Minor Arcana paired? Most Majors were paired with Minors for their numerical correspondence and then assigned a suit that made sense to me intuitively. I referenced the Smith-Waite deck and also used Rachel Pollack's book Tarot Wisdom, which discusses correlation between Majors/Minors. Example: 7 of Spades/The Chariot. In the Smith-Waite deck's 7 of Swords, a man appears to be stealing swords. His expression indicates that he's getting away with something. To me this indicates a breaking of rules, while the Chariot indicates victory. In The Illuminated Tarot, the horses have broken free of their gated enclosure. Some may read this card from the point of view of the horses and others from that of the barn owner. So the card could indicate either triumph or loss as a result of breaking the rules. Does The Illuminated Tarot deck use reversals? 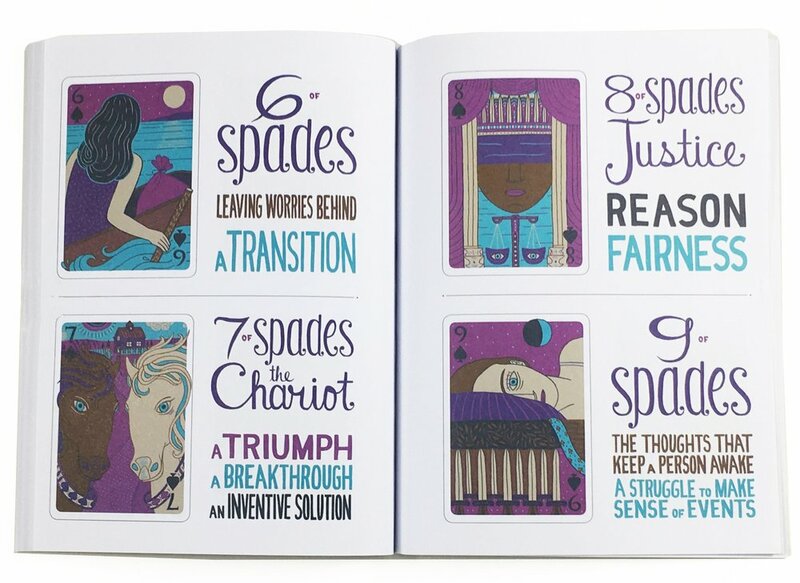 If you read using reversed meanings, it will be challenging to do so with this deck because the court cards and many other images read the same in both directions, but since the book descriptions are deliberately short and simple (more like word association than definition) you can interpret the cards in the way that makes the most sense in your reading. Reversed meanings are often apparent in the context of a spread. I recommend checking out Little Red Tarot's posts on reversals--especially this one. I personally find reversals confusing and they increase my reliance on the book. I hope that reading with The Illuminated Tarot will be simple and intuitive, and that the guidebook’s keywords will spark an idea of what a card represents. I'm new to tarot. Are there any books or resources that you would recommend? The two books I looked to the most in researching card meanings and in learning about the system of tarot were Tarot Wisdom by Rachel Pollack and The Way of Tarot by Alejandro Jodorowsky and Marianne Costa. A newer book that I really like is Jessa Crispin's Creative Tarot, which includes art and literary references with each card description.